PLEASE NOTE! 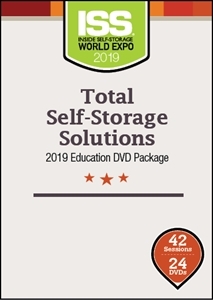 This is a pre-order of a video that is being recorded at the Inside Self-Storage World Expo in Las Vegas, April 1-4. We expect all DVD pre-orders to be shipped no later than June 21, 2019. For questions about an order, contact Customer Support. For more detailed descriptions, please refer to the individual DVD product pages. Individual sessions will also be available as on-demand video in late June.